A-HOTEL.com - Luxury and cheap accommodation in Belyaninovo, Russia. Prices and hotel, apartment booking in Belyaninovo and surrounding. Veshki Guest House features free WiFi and views of garden in Veshki. With ski-to-door access, the property also has a garden, as well as a terrace. Situated in Mytishchi, 2.4 km from Ice Stadium Mytischi, Ваша Зона Комфорта На Колпакова 41 offers a living room with a flat-screen TV. Featuring paintball and carting facilities, this hotel is 500 metres from Nagornoe bus stop, providing direct access to Moscow. It offers a sauna and air-conditioned rooms with a work desk. Situated in Mytishchi, just 2.7 km from Ice Stadium Mytischi, Comfort Zone offers accommodation with free WiFi. Set in Mytishchi in the Moscow region region, Apartment on Mira 34-a has a balcony. The accommodation is 1. Featuring a bar, Skazka Vostoka is set in Mytishchi in the Moscow region region, 1.7 km from Ice Stadium Mytischi and 13 km from Kva-Kva park, aquapark. Apartamenty VyDoma Kolpakova 34b enjoys a location in Mytishchi, just 1.7 km from Ice Stadium Mytischi and 13 km from Kva-Kva park, aquapark. Apartment Kolpakova 29 offers accommodation in Mytishchi, 1.3 km from Ice Stadium Mytischi and 13 km from Kva-Kva park, aquapark. Your House Apartment on Kolpakova 29 for 4 persons is an accommodation located in Mytishchi, 1.3 km from Ice Stadium Mytischi and 13 km from Kva-Kva park, aquapark. Set in Mytishchi, 3.2 km from Ice Stadium Mytischi, BestFlat24 2 комнатная Мытищи provides a living room with a flat-screen TV. 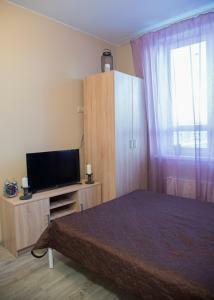 Set in Mytishchi, just 2.8 km from Ice Stadium Mytischi, Apartment on Troitskaya features accommodation with free WiFi. Situated 400 metres from Ice Stadium Mytischi in Mytishchi, BestFlat24 Letnaya offers accommodation with a kitchen. Guests staying at this apartment have access to a balcony. Apartamients Kvartal 9/18 is a property set in Mytishchi near Ice Stadium Mytischi. The Kva-Kva park, aquapark is within 13 km of the apartment. Lecco Hotel is situated less than 3 km from the centre of Mytishchi and the Yauza River. It offers spacious rooms, free Wi-Fi and free private parking. Ваша Зона Комфорта Летная 21/2 Люкс is located in Mytishchi. Free WiFi is available in the apartment, set 400 metres from Ice Stadium Mytischi. Ваша Зона Комфорта Летная 21/2 Оазис in Mytishchi provides accommodation with free WiFi, 400 metres from Ice Stadium Mytischi. This property is 13 km from Kva-Kva park, aquapark.